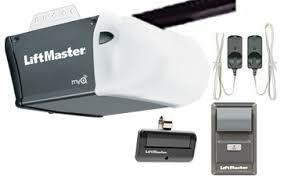 This Liftmaster Chain Drive Garage Door Opener is the ideal choice for cost and dependability. Its long-lasting 1/2 HP motor combined with an industrial-strength chain drive will provide smooth, steady performance year after year. It also comes with Security+ 2.0 and MyQ Technology. Included with the Liftmaster Chain Drive is the Multifunction Control Panel and the 1 button Remote Control. The Motors from Liftmaster are reliable, long-lasting, and powerful. The Liftmaster Chain Drive system with industrial-strength chain drive supplies steady operation and lifting power for the Liftmaster Chian Drive garage door opener. It is energy efficient and will consumes up to 75% less power in standby mode. The Security+ 2.0 safeguards your household with every click. A new code is sent to the Liftmaster Chain Drive garage door opener. That way the door opens only for you. The PosiLock will lock down your door by electronically watching against a forced opening. Alert-2-Close warning system offer audible and visual warnings when the garage door is about to close. The Protector System has safety sensors sending a light beam across the garage door opening. This will automatically reverse the door if anything interrupts the beam. With your smartphone, tablet, or computer you can control your Liftmaster Chain Drive garage door opener and hosue lights. The MyQ technology in the Liftmaster Chain Drive enables you to securely monitor with your devices. Alerts can be received as email or pop-up notifications on your device. That way you always know the status of your garage door and house lights. MyQ mobile app is a free to download and requires no annual activation fee. Making it very easy to connect to your Liftmaster Chain Drive opener. The Manufacture Warranty is 4 year motor warranty for Liftmaster Chain Drive garage door openers and 1 year parts warranty.